The Brass, Percussion, Harp and Voice department provides exciting opportunities for learning and performing, with a world-class team of instrumental teachers who are leaders in solo, chamber and orchestral performance. Each student’s journey is individual, and the department offers rich and diverse programmes for these instruments which develop students both as solo players and as flexible ensemble members – a combination of qualities that will be essential for their future success. Players from this department form a vital part of the Chamber and Symphony orchestras, as well as chamber groups and the Contemporary Ensemble. In addition to mixed chamber music there are several family-group ensembles which provide additional performance opportunities, and for first and second study voice students there are chamber choirs and many solo performance opportunities. Many of our students are members of the National Youth Orchestra (NYO) and National Children’s Orchestra (NCO), and attend Junior conservatoire departments on a Saturday. Kevin has had an illustrious career combining life as an orchestral player with teaching at the highest level. 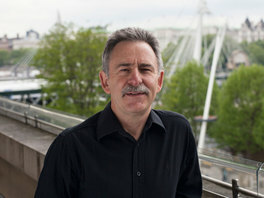 He is still a member of the Philharmonia Orchestra based at the Royal Festival Hall and until his appointment at The Purcell School in 2008 he jigsawed his role of co-principal percussion with that of Head of Percussion at the Royal College of Music, coaching many of the leading percussionists in UK orchestras today. Over the last 30 years he has toured the world extensively, performing with some of the world’s greatest conductors and soloists in the finest concert houses. He began his musical life as a trombonist and secured a scholarship to study both trombone and percussion at the RCM, with percussion eventually dominating his musical output. He was a founding member of the Wallace Collection brass ensemble and in 1992 was awarded a Winston Churchill Fellowship to research pedagogy in the U.S.A. He co-devised the current ABRSM percussion syllabus and very much enjoyed being a generalist examiner for 10 years before taking up his current role as advisor to the Board. As an animateur he has presented and conducted numerous concerts in the USA, Malaysia and all around the UK in major venues. His unique micro-orchestra, Albert’s Band, is the resident outreach ensemble at the Royal Albert Hall. This group of 15 musicians specialise in high-octane family concerts and school projects, breaking down boundaries between the performer and audience with its energy and wit in presenting the Classics. His musical day extends to his home in North London. His wife is a professional violinist and his two children pretend to enjoy Dad’s practise supervision!